Have you heard of the Enneagram test? I’ve been a sucker for personality tests from the moment I first took Strengthsfinder and learned my “top 5 strengths.” I loved learning more about what I was good at, how to be a better leader, and understanding what made other people tick. Many leaders I know are the same way. I grew up in a conservative Bible-belt home with an intense repulsion to anything that felt like Eastern mysticism. An example: my parents wouldn’t let us read the fortunes inside fortune cookies because they didn’t want us to believe in fortune telling. My point being, there is something hardwired deep inside me to look at a drawing that looks like a pentagram, say “nooooope” and then pray for forgiveness for even looking at the picture. 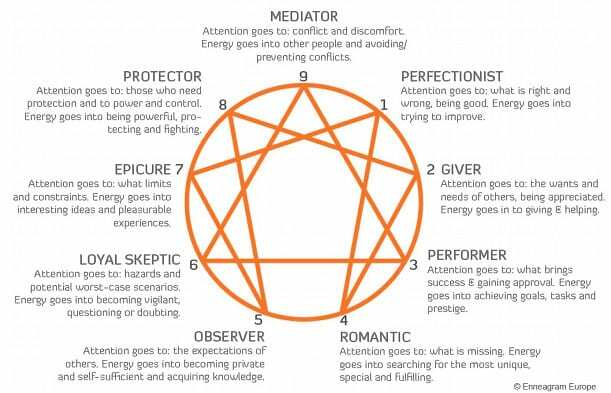 This changed when in my last church role I joined a team fascinated by the Enneagram test. Because I trusted these people as followers of Christ, I gave it another chance, and what I discovered was that the Enneagram test, when used well, can actually be one of the most Christian worldview-friendly and spiritually beneficial personality profiles I’ve ever used. Here are four reasons I now love the Enneagram test, and would highly recommend it to anyone trying to develop as a church leader. Most personality tests focus on why you as an individual are special. Strengthsfinder (which I still love) says each person has a unique set of talents that allow them to be great. The Enneagram test, however, says that while there are certain admirable qualities every person brings to the table our personalities at their core are a protective covering we use to help us adapt to the pain and dysfunction in the world. To use Christian language, the Enneagram test believes we are all born into a world of sin, and are fundamentally marked by that sin. The Enneagram test identifies nine different core personality types and at the heart of each of them is one of the deadly sins (plus “deceit” and “fear”). This makes the Enneagram test a far less fun, but arguably more valuable, tool of self-discovery. While Strengthsfinder and Myers-Briggs provide a rush of positive self-discovery, identifying your number or type on the Enneagram test often carries with it a sinking sensation of “oh yeah, that core sin runs deep in me.” Because of this it often takes longer to identify your personality type on the Enneagram test, because we are hardwired to run away from the deep brokenness inside us. Because the Enneagram test dials in to the core sin behind each personality, it can be a great tool for allowing God to do deep soul work in your life. I identify as a “four” on the Enneagram test which means I feel things deeply, define myself by my individuality and value authenticity. It also means that I am constantly envying others who seem to be experiencing the fulfillment in life I want for myself. When I first read a four’s core sin is “envy,” a light bulb clicked on. I began to realize how much energy I spent comparing myself to others and despairing over my inability to be like them. It’s a miserable way to live. As I’ve brought this discovery into my devotional life I’ve found God leading me to the heart of why I have this envious spirit and how he wants to free me from it. God is using the Enneagram as a tool to make me a more secure leader. In his phenomenal book The Road Back to You, Ian Morgan Cron explains that when used rightly the Enneagram test creates empathy for others. Rather than using the Enneagram test to label people as “other types” it helps you understand the core pain behind someone’s personality type. As I guess what someone’s type might be in pastoral counseling it helps me guide them to what core sin might be behind their behavior and then give them the good news: God has something so much better for them then the pain they’re embracing. On my previous team I had an “eight” whose biggest motivation is “the need to be against.” This is the person on the team who when everyone agrees will argue the other side just for the sake of doing it. Sounds fun, right? It’s easy as a leader to develop an adversarial relationship with this person or to take their pushback personally. What I’ve discovered though is that eights are often the people who help you spot problems others aren’t seeing and who will usually back down if you make them feel heard. Realizing that made me both more appreciative of this person on my team and gave me tools on how to lead them better. All this to say, the Enneagram test has made me a better leader, a more compassionate pastor, and a healthier follower of Jesus. If you’re interested in learning more, I’d highly recommend the book I mentioned earlier, The Road Back to You. It’s a great entry point to seeing the enneagram test from a Christian point of view. If you step into it, I hope you also discover that this weird, New Age-looking diagram is actually a powerful tool God can use to make us better followers of him and leaders of his church.